OK, I've had it. 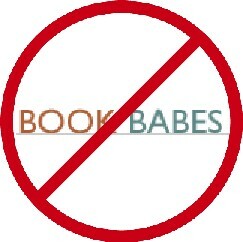 Add your voice to this petition to give the so-called Book Babes their walking papers. I'm sure they're perfectly nice old ladies but they are neither Bookish nor Babes. Jessa links to this item about Lawrence Weschler's proposed new magazine Omnivore. She's a bit dismissive, comparing it to The Believer, but I have higher hopes. I've admired Weschler ever since Mr. Wilson's Cabinet of Wonders. I vastly prefer his writing to Eggers' and he's shown no evidence of a self-indulgent streak. TEV wishes this endeavor well - send us off a protoype. We're tastemakers! Mr. Weschler is dissatisfied with current newsstand choices, contending that extended nonfiction reportage intended for general-interest magazines has atrophied amid “the increasingly peg-driven, niche-slotted, attentionsqueezed, sound-bit media environment of recent years.” In short, writers such as A.J. Liebling, John Hersey, and Joseph Mitchell would feel crunched for space today. Something - I'm not sure what it was, perhaps confinement to the sickbed - triggered a memory this week of Erich Kästner's classic children's book Emil and the Detectives, which was a fixture of my childhood. (Given that my mother is Austrian, I was exposed to a fair amount of German language children's stories, albeit in translation. Some - like Struwwelpeter - left a lasting impact.) The book was also turned into a 1964 Disney movie (remade in 2000), of which I have fond memories. At any rate, I located a copy which arrived today, and I promptly sat down with it. I got about halfway through the first chapter, where the characters are talking about Berlin, when it occurred to me that I didn't know when the book was written. I looked at the flyleaf and saw it was written in 1929, the dying days of Weimar. And, of course, I began to see the work very differently. Kästner begin his literary career as a journalist, thenproduced light but ultimately serious poetry, against thebackdrop of the rise of Nazism in the Germany in theinter-war years. His books were later burned by the Nazis. At any rate, I've got familiar company for the tail-end of my recovery, and so far the only obvious difference I can recall from the cherished translation of my youth is that The Man in the Bowler Hat is now The Man in Stiff Hat. (This is the May Massee translation from 1966.) Nevertheless, I suspect much will be different in this reading. Oh, apropos of nothing, apologies to anyone who found sluggish responses from this site yesterday. (And we mean technical, not intellectual; those are pretty much always shot.) Typepad was having issues, which they claim are sorted out now. The other day Ron wrote at length about James T. Farrell. Showing once again how far ahead of mainstream media we cliqueish bloggers are, here's the latest from the San Francisco Chronicle - on James T. Farrell no less! James T. Farrell was born in obscurity on Feb. 27, 1904, and, notwithstanding Friday's centennial hiccup, will probably wind up where he started. The author of the "Studs Lonigan" trilogy and far too much else, Farrell had a literary career that climaxed almost immediately. Lots of novelists never surpass their first success, but Farrell may be the only one who peaked before finishing his first book. All three of that novel's installments, "Young Lonigan," "The Young Manhood of Studs Lonigan" and "Judgment Day," have just come out from the canon-keepers over at Library of America. Put this together with Robert K. Landers' mercifully definitive new biography, "An Honest Writer: The Life and Times of James T. Farrell" (Encounter Books), and Farrell is now surely experiencing as much of a revival as he ever will. For anyone fascinated by the cruel calculus of literary reputation, Farrell's story makes for a harrowing read. OK, I'm really tempted to make some kind of Canada joke here but I want Sarah to stay my friend. So read it for yourself: Margaret Atwood and poet Robin Mathews on the question of Canadian identity. The issue, therefore, of Canadian identity, was very much on the front burner in Canada in the 1960s and 1970s. This is why Atwood’s Survival (1972) caused such a commotion when it was published. Atwood, as I mentioned above, dared to argue that the dominating myth in the Canadian way was that of survival. Many were those who doffed their dutiful caps to Atwood’s thesis. Many were those who buzzed round the hive and paid honours to the new queen bee of the Canadian literary establishment. But, not all were in agreement or pleased with the way Atwood defined the Canadian identity. It is important to remember that Mathews was offered a worthy wave of the hand and tribute by Atwood in Survival. Both Atwood and Mathews were neck to neck, at the time, in the race to define the Canadian identity. It is true that Canadians are not Americans, but what does it mean to be a Canadian? This was the core of the dialogue and debate, and Atwood had shown her hand. Mathews was not pleased. In a piece I'm sure Sarah would run if she were here, the Nation reports on some rather interesting sounding Italian crime fiction. A new quartet of detective novels from Italian crime writer Andrea Camilleri, published here by Viking and Penguin, takes us to the fictional waterfront town of Vigàta, in Sicily. Camilleri's protagonist is the overworked, straight-talking, politically radical Inspector Salvo Montalbano, whose passion for solving crimes is equaled only by his love of the perfect pasta al dente and the novels of his namesake, the contemporary Spanish detective writer Manuel Vazquez Montalbán. (Although Montalbán's works have not found a home in the United States, British publisher Serpent's Tail has been translating him into English for years.) When Montalbano hits a wall in his sleuthing, he's known to turn himself around by asking himself what Pepe Carvalho, Montalbán's famous sleuth, would do. Like Mike Hammer or Sam Spade, Montalbano is the kind of guy who can't stay out of trouble. He's in a long-term, long-distance relationship with the smart and independent Livia, but every time they arrange to see each other, a corpse or two--usually bearing the marks of a deviant tryst--comes between them. (Over the course of the four books, this puts a considerable strain on Salvo and Livia's relationship.) Montalbano is competitive and narcissistic; he exploits personal relationships to turn up clues, and often gets friends and witnesses killed during his investigations. Still, deftly and lovingly translated into English by Stephen Sartarelli, Camilleri makes it abundantly clear that under the gruff, sardonic exterior our inspector has a heart of gold, and that any outbursts, fumbles or threats are made only in the name of pursuing truth (and, often, thwarting Italy's egocentric and dishonest politicians in the process--but that's another story). Greece Now interviews Dr. David Ricks of King's College, London on the subject of his Modern Greek Writing: An Anthology in English Translation - a subject about which we know absolutely nothing but are willing to learn. Suggestions? What socio-political and historical course is traced out by the literature in the book? What do we learn about Greece from the collection? The book attempts to trace, through the individual (and often individualistic) responses of writers since 1821, some sense of how poetry and prose have responded to (and indeed helped to create) certain moods in certain historical settings. It is easy for foreigners, who know the peaceful and prosperous Greece of today, to ignore the often-painful history behind this and also to be too little aware of the resources literature has to offer in unpropitious circumstances. In another item, the same site reports that Greece's best loved author, Antonis Samarakis, has died. It's official, J.K. Rowling's a billionaire. And I say good on her. Rowling, once an unemployed single mother, saw her wealth rise to $1 billion after the publication of the latest "Harry Potter" novel and the success of the wizardly character as a movie franchise, the magazine said Thursday. Jasper Fforde, whose Tuesday Next books have been on our radar for some time, will be reading in LA on March 1. We'll probably go check it out since we're at least vaguely curious about his stuff, which sounds entertaining. You check out a sample chapter from three of his books here. We're outta here. Have a most groovy-like weekend.